Cinco de COTA Welcome letters! – NASA – Texas Region | We Drive Harder! Cinco de COTA Welcome letters! 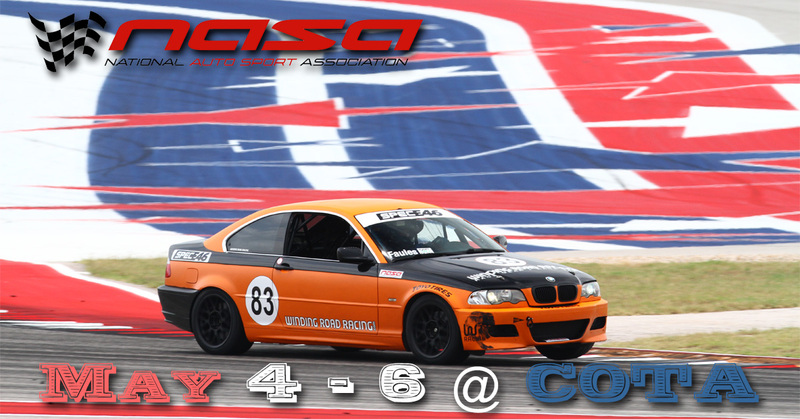 Thank you for registering for our 2nd Annual event at Circuit of the Americas, Cinco de COTA! We have a new record size event for the second year in a row with entries coming from every single NASA Region! Please make sure to go through all the information provided here as there are many important details around this event. We have a very festive party planned for Saturday night with fajitas, enchiladas, the works, and drinks all provided free of charge to all participants, crew, friends, fans, and family! The DJ will start playing music when we tap the kegs and start serving food at 6pm in the media center! There are some other non-racing festivities going on at the facility this weekend in the amphitheater. COTA is staffing extra security in the paddock overnight for us and has assured me that there has never been an issue with a non-racing event going on at night with race events in the paddock. Because of this all participants should plan to enter and exit the facility through Tunnel 2 off of Circuit of the American Blvd near the back straight. We have been assured that there will be no access to the paddock from Lot A or the amphitheater from concert-goers. With all that, we always recommend securing any valuables and remind you that neither COTA or NASA are responsible for lost or stolen items. We’ll start move-in at 5:15PM on Thursday. If you plan to arrive early please see these maps and lineup in the proper place. For whatever reason if you end up in the wrong line we’ll go well into the night just moving in, so please make sure to get in the correct line and please be patient with our move-in staff. It is not going to go quick, but we are going to do our best to move everybody in a timely manner as well as make the best use of space possible. So again I have to reiterate that if you plan to come in on Thursday afternoon we ask that you be very patient with our staff as we’re looking out for the paddock to be used as efficiently as possible. Thank you in advance for your understanding and patience here. Firouz Haghighi is the Parking Czar and will be your point on contact on the ground for the move-in. To see where the lines will be for early arrival please click HERE. HPDE Welcome letter can be found HERE. Race and TT Welcome letter can be found HERE. Garage Assignments can be seen HERE. Paddock map can be seen HERE. Entry List can be seen HERE. Please take a minute to double check your entry and make sure we have the correct car, car number, and transponder number (for timed classes) before the event. COTA Cafe in the Media Center will be open for lunch all 3 days from 11:30am – 1:30pm. Thank you for supporting NASA, we can’t wait to host you at Circuit of the Americas!